"The Ash Tree" now generally available. "The Ash Tree" is now available to libraries and independent bookstores through Baker & Taylor, and I hope you'll encourage your local library and indie bookstore to order it! Here again is a brief summary: "The Ash Tree" (ISBN 9780981854762) tells a timeless story of the romance and marriage between an American Armenian girl and her immigrant husband who survived the 1915 Armenian Genocide in Turkey. In the aftermath of the Genocide from the twenties to the early seventies, the couple and their three children become vivid, quintessentially American characters, only for tragedy to find them again, echoing the staggering loss of 1915. Its cover painting with its frayed and white-washed frame is by the author’s wife, Jeanette Melnick. Lovingly produced and brilliantly structured to combine history and fictionalized memoir, The Ash Tree is an important, beautifully written novel of survival, new life, and heartbreak. 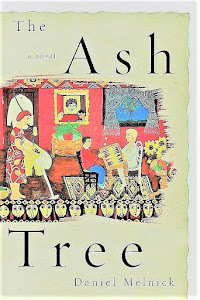 See the blog site for www.theashtree.net for a fine notice about the novel from the Armenian Weekly and for other updates about The Ash Tree. Also check out the facebook page (and hopfully like it) at www.facebook.com/theashtreeanovel.